Registration is $20 and ends at noon. Pre-registration before June 11th is $18 and includes an extra grand prize ticket. This is not a judged event. Awards are $1200 in cash plus prizes starting at 10am, as well as Best of Show Production and Best of Show Modified. 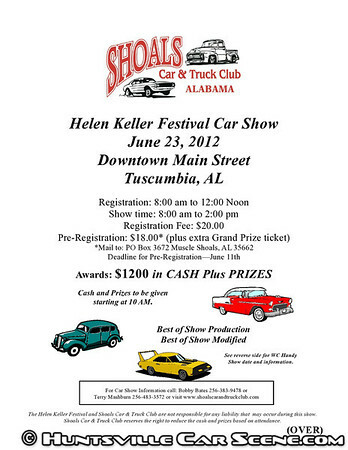 This is a great family event that transforms downtown Tuscumbia into a day-long festival with a car show at the center. Hey Madison County folks. The GR8 N8 car show registration doesn't end until 5PM so when your headed back from this great car show stop in and win another trophy (or 50/50 or door prize) and help us find a cure for type 1 diabetes! 2nd Annual GR8 N8 Car Show with all proceeds donated to the Juvenile Diabetes Research Foundation. Last edited by g8gt; June 17th at 09:43 PM.